Hampi can be hot, dry and dusty throughout the year. For this family day trip, pack sunscreen, scarves, hats and plenty of liquids. Wear light, full-sleeved, full-legged cotton clothing and comfortable shoes. Also, pack a snack or a picnic lunch to enjoy by the river. It is easy to get lost in the crowds, so keep your kids close. The crowds can get overwhelming if you aren't used to India. Everyone we met was friendly, but had different definitions of personal space. Keep your eyes, ears and mind open, and you'll have a good time! Start this itinerary in the late afternoon, around 3 p.m. The crowds in Hampi seem to be thinner by this time, and the weather only gets cooler toward the evening. November through February are the coolest months (by coolest, I mean the least hot!) to visit Hampi. Plan your family vacation to India then. However, avoid the last week of December and the first week of January. These weeks can be especially crowded, given that schools are out for Christmas and New Year. 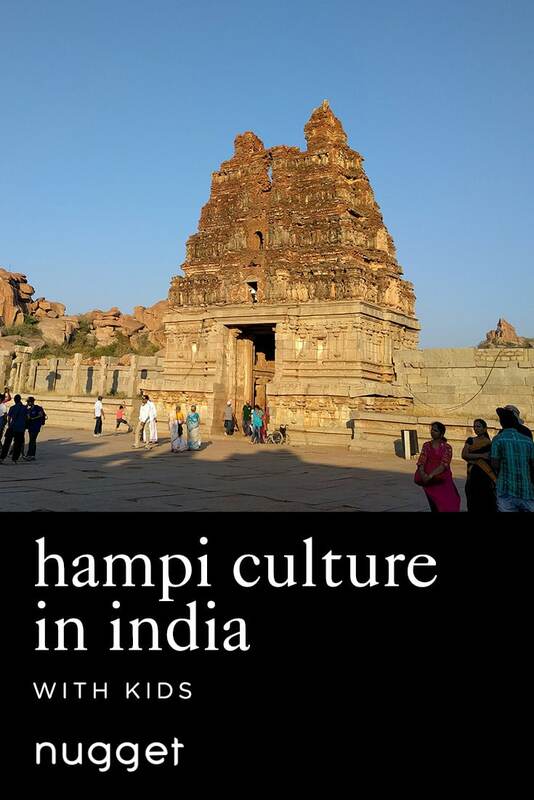 Book a local tour guide and a taxi (or cab with a driver) for your family trip to Hampi in advance. Negotiate for a good price. If you wait until the last minute, you will be at the mercy of aggressive salesmen. Vijaya Vittala Temple of Hampi is full of rich history and incredible architecture - the kind that leaves you standing still in your tracks. It is surrounded by large boulders, creating a compelling landscape and providing great photo opportunities. Just behind the temple complex is the Tungabhadra River - the perfect place to sit and enjoy a packed lunch in peace, surrounded by boulders and spirits of the glorious past. This is the perfect itinerary for families visiting India with kids who want a mix of history and relaxed family time. Vijaya Vittala Temple is one of the most popular Hampi attractions. Built in the 15th century, the temple overlooks the boulders of Hampi and has plenty of architectural wonders and history to keep parents engaged. Kids can run around in the free space and climb the many stairs. Our little nugget loved counting the elephants and horses carved into the walls, walking around and making new friends. If it gets too hot, you can easily seek shelter in one of the many temples. It’s also a great spot to people-watch while your kids are running up and down the steps! DIRECTIONS Hire a cab with a driver for the day. The driver can drop you off at the base of the temple, where you can either walk 1 km (0.6 miles) to the entrance or ride in one of the chauffeured golf carts. TIP The drive/walk up can get dusty, so make sure you have scarves to cover your faces during your family trip to India. If you decide to take a golf cart instead of walking, there may be a bit of a wait. The banks of the Tungabhadra River is a quiet place for families to relax and unwind after the hustle-bustle at Vijaya Vittala Temple. The view of the river and surrounding boulders also makes for a fantastic photo opp. Your kids will enjoy the quiet after the crowds, and will most likely want to spend the afternoon collecting pebbles and throwing them in the water! DIRECTIONS Walk to the back of Vijaya Vittala Temple, to the point where people line up to take the golf carts back to the parking entrance. Walk past the lines on the trodden path, heading towards the back of the temple. There will be a few paths that wander off to the left, but stay on the path toward the back of the temple. After a few minutes, you will arrive at a spot with a local chai (tea) shop, behind it you will see the Tungabhadra River. TIP Carry a snack or a picnic lunch to enjoy this scenic spot during your family vacation to India. You can sit on the stone benches near the local chai (tea) shop or walk down closer to the river to sit on the rocks and eat in peace.